When the organiser and head-marshal is involved in a recovery involving one winch, four straps and lots and lots of mud, you know things are messy. 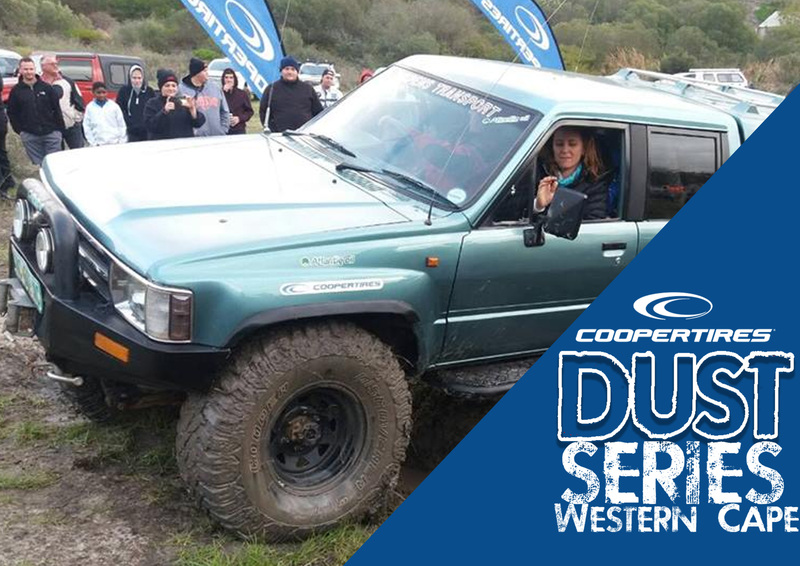 On Saturday, the second event of the Cooper Dust Series in the Western Cape took place, and boy, was it a muddy affair! After some head scratching, Thys’ Jeep Wrangler was anchored to a tree behind him, the Disco was winched out and the initial recovery process to get Jason’s Colt unstuck could begin. Once Jason was out, he decided to call it a day. This was once again proof that the prologue stage is an all-important one in the Cooper Dust Series, and something competitors needs to keep in mind going into the final event in September, as well as the grand finale in the Tankwa in November. Starting 25th out of 25 cars meant that Jason had to drive up the hill, which wasn’t even part of an obstacle, but just a transit from the start to the first checkpoint, after the 24 cars before him churned it up and heavy rains turned it into what can only be described as a ‘snotterige’ mess. For the 24 cars before him the rest of the terrain was manageable with rocks giving much needed traction and grip to complete the event obstacles without too much trouble. He-who-shall-not-be-named (*ahem* Marno *ahem*) did however manage to take on a part of the trail which common sense would have dictated to skip in slippery situations, most people would skip it in the dry, and planted his vehicle on its side. A small tug from marshal Johan de Kock in his Hilux helped him up and on his way and he completed the rest of the event and the trail with only a dented ego. But at the end of the day, despite the rain and the cold, most competitors who stuck around after they completed their drive (who can blame those who left in search of dry clothes?) agreed that it was fun, challenging and not your normal Saturday out. Exactly what we aim for! Precision driving is what won it for Denille de Kock, driving his wife’s Ford Ranger (with her as co-driver) after some clutch problems left his Discovery crippled before the start of the event. They were 51 points clear, thanks to an obstacle where they were the only team to get full points and 50 all-important bonus points. Were it not for those bonus points, they would have only beaten the man from Mossel Bay, fondly known as Oom Pajero among the organisers, Herman Neethling by a single point. But Herman proved once again that his skill and competitiveness gives him an edge. The battle for third and fourth was also decided by a single point, with Gert Burger in his Nissan Patrol pipping Micheal Simpson in his FJ Cruiser to the podium. So the three new qualifiers for the Tankwa final have some respite and the race for the remaining three qualifying spots, as well as the wildcard entry, will be decided on 16 September in Lambert’s Bay on the dunes. As it stands, there are only a handful of points separating the next five competitors for that wildcard entry, and with competition being as close as it is, anyone can take it. The full log and results can be seen here. Next Cooper Dust Series: Western Cape 3 – Entries open!